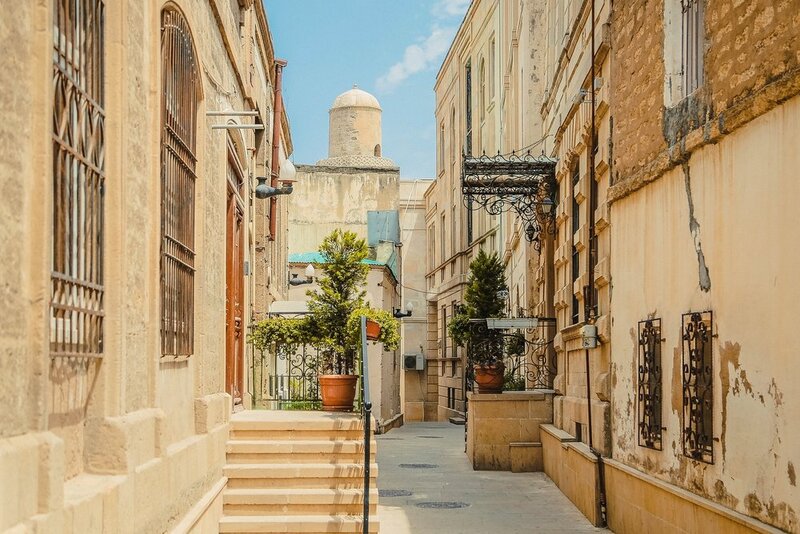 This is your perfect itinerary for exploring Baku in 48 hours. Including the best things to do in Baku as well as practical Azerbaijan visa information, places to eat and transport from Baku to Tbilisi. There are enough things to do in Baku to fill two or three days, if you have a little more time there also some day trips from Baku that you can consider. We travelled to Baku by overnight train from Tbilisi and spent three days in the city but we took it slowly and could easily have condensed our time into two days. Baku is a bit of a strange city and seems to still be finding its personality between its old traditions and history and its new influx of oil money and Middle Eastern tourism. Think ancient walled town mixed with giant shopping malls. It’s quite a large city so we’ve created this Baku itinerary to make sure you see all the top spots in Baku in your two days. Azerbaijan has recently introduced an e-visa system. You need to apply online 3 working days in advance, upload a copy of your passport and fill in the details. It costs $24 USD including fees. Bear in mind that even if the visa is processed faster it won’t be valid until after the 3-day period. We applied for ours on a Thursday and, despite having it approved on the Friday, couldn’t use it until the following Wednesday (weekend doesn’t count!) The visa is valid for 3 months and you can enter for 30 days so it pays to apply a bit early. *TIP* You don’t have to have accommodation booked. We stayed at a friend’s place but didn’t have their address at the time so put a random hostel address in and had no problems. If you do want to book accommodation in advance there are plenty of options in the city, any of which will be fine for your visa application. If you’re coming from Tbilisi the overnight train is the best option. It takes around 13 hours so you have good time to sleep. You’ll cross the border about an hour out of Tbilisi and arrive in Baku the following morning. Our train left at 7.30pm and arrived at 9.10am and was perfectly on time. We were there in November but apparently the times change during the winter and leave a little earlier so make sure you check. Tickets cost €15 each way in 2nd class (4 berth cabin). But we had the cabin to ourselves both ways. It was around €25 for first class and €10 for the open cabins. Take food and drink with you. There are also buses and plenty of flights that go to Baku from all over Europe and the Middle East. Language: Azeri, most people also speak fluent Russian and many younger people speak at least basic English. We walked everywhere in Baku, we like to use this as our form of exercise while travelling but if you’re not so keen on walking all day there are affordable taxis and a metro system which costs about 10c per trip! You can find the map here. Start with a traditional Azeri breakfast which consists of freshly baked bread, a variety of cheeses and dips, honey and a mix of fresh herbs. All washed down with a glass of tea. You’ll find this assortment available at most local restaurants but we particularly liked Sehrli Tendir in the old town. This is a good place to start your day. The Old Town is small and easy to walk around in half a day. It lacks the charm of many old towns we’ve visited as most of it appears to be newly built. The renovations are to make it more appealing to tourists but for me, it’s a bit too well redone and it doesn’t really have the quaint feel of a historic area. But there are still a few noteworthy places to see within the walls. This is a monument on the edge of the old town that dates back to the 12th century. It is an Azeri icon and can be found on the money. Inside is a museum about the evolution of Baku and you can also climb the tower to see views of the old town and the city beyond. Entrance costs 10AZN. This is a complex including some museum displays inside an ancient palace. It costs 10AZN per person for entrance. It takes around an hour to wander around the entire thing and while it’s not mind-blowing, it’s an interesting and historical place to see in contrast to the modern buildings surrounding the old town. Just along the street from the fortress is my personal favourite attraction in Baku. The world’s largest collection of miniature books! It’s free to enter and is just one room so can easily be browsed in 20 minutes. There are cabinets of books from all over the world making up the more than 6500 books in this interesting and adorable collection. Around the corner is an artist’s residence where you can step inside and see all his wonderful creations. The artist himself is usually hanging around and is happy to speak to visitors about his work. It's free to go inside and check out some of his work and photos of his travels and visitors. Just outside the gates of the old town is the Museum of Literature. You’ll notice the façade as you walk past. 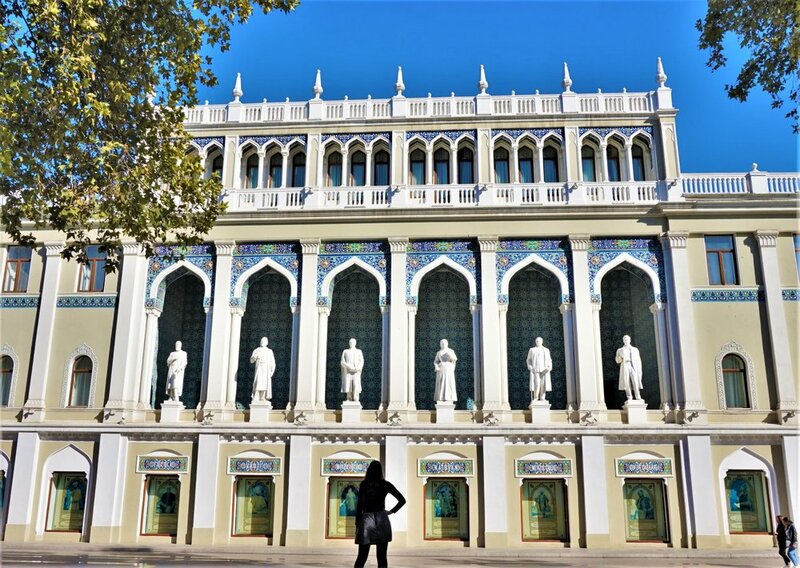 It is a beautifully tiled wall with statues of famous Azeri authors and poets. We didn’t actually go inside the museum but the front was beautiful enough. Once you’ve seen all these parts of the old town you’ll be ready for some lunch. Kebab is really popular and cheap in Baku and makes a great lunch on the go. Grab one of these and head to the waterfront to enjoy a picnic while staring at the Caspian Sea. After lunch take a stroll along the waterfront towards the icons of Baku, the flame towers. Built in 2012, they house offices, a hotel and apartments. Just off the boulevard is a funicular which will take you to straight up to the towers for 2 AZN. You can’t actually go inside them but they are incredibly huge and impressive to see up close. At the top of the funicular, you are in Dagustu Park. Perfectly located for city views, afternoon strolls and sunset gazing. Spend some time wandering the Alley of Matyrs, a cemetery dedicated to Azeri soldiers killed in war, and enjoying the surrounding gardens. There are several view points to stop and enjoy the golden hours as you make your way back down towards the bottom of the funicular and the waterfront boulevard. As it gets dark the city lights up and you can enjoy the light show displayed on the outside of the flame towers. It’s the perfect way to end your first day in Baku before heading for some food and a relaxing evening. We stayed with friends, but you can find some accommodation options here. Another round of Azeri breakfast? If it’s not your thing you can head to Hocca where they do a range of foreign breakfasts including a full English. They also have great coffee so you can save it for a coffee break later in the day too. Unless you feel like walking for a few hours today is going to involve a taxi or metro ride. Start by heading to the Heydar Aliyev Centre. This huge feat of architecture was built in 2012 and has won design awards. It’s worth going just to see it from the outside (which is what we did) but inside there are a range of exhibitions. There is an exhibition of historical Azeri artefacts including instruments and clothing as well as rotating exhibitions throughout the year. It was retro cars when we were there. Entrance costs 12 AZN per person. After your visit make your way across town to the radio tower. It’s possible to walk from the flame towers (about 20 minutes) or take a taxi. There are great views even from the foot of the tower but if you’re feeling super fancy you can splash out on a meal or drinks at the rotating restaurant at the very top. It costs a minimum of 20 AZN per person which you pay as a deposit when you enter the restaurant. You’re then free to order from the menu and pay anything additional at the end of your visit. For us, the views from the bottom were enough having already experienced a rotating bar in Tirana, Albania. But if you have the time and money I’m sure the views are amazing and sitting at a table that does a full 360 around the viewing tower is an epic way to enjoy a glass of wine! From here you can walk or take a taxi back down to the city and go and pack in time for your night train back to Tbilisi, satisfied that you’ve seen the must-see sights of Baku. If you have a bit more time you could check out the Baku Zoo or take a day trip to the mud volcanoes. The night train back to Tbilisi leaves at 21.10 every day and there is a shopping mall next to the station with a food court and a supermarket to spend your last manat on dinner and snacks for the journey. Baku is not a place that’s high on our list to return to but we certainly had a fun and interesting few days in the capital of Azerbaijan!